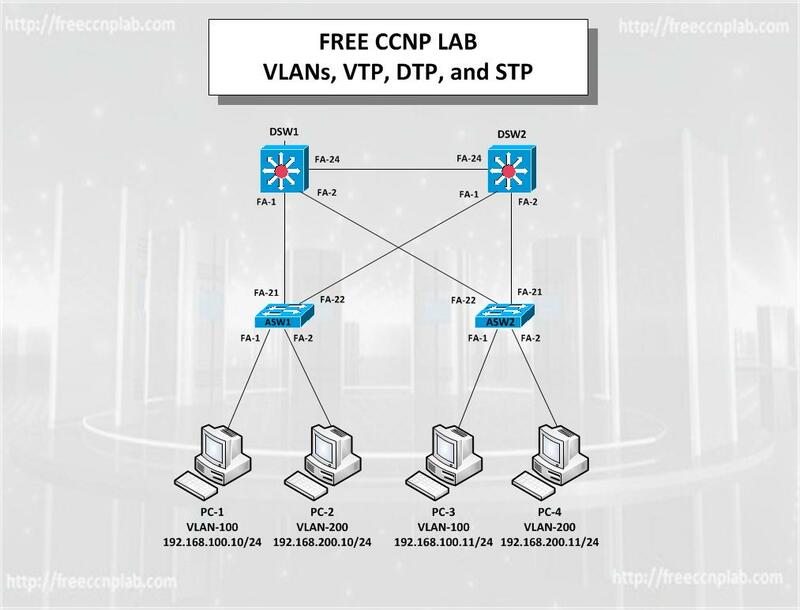 This lab will help you better understand basic VL AN, VTP, DTP and STP implementation and configuration of Cisco Catalyst switches. In this lab we will be configuring four switches in a fault tolerant configuration. You will practice what you have learned in previous labs by doing basic switch configuration such as hostname, password and no domain lookup. You will then enable VLAN Trunking Protocol (VTP) and configure Dynamic Trunking Protocol (DTP) on all switches. Finally you will manually configure the primary and secondary Spanning Tree Protocol (STP) root bridges on the distribution switches. This lab has been created as a Packet Tracer activity due to the lack of switching support in GNS3, although if you wish you can complete the lab using a switching module installed in a router with GNS3 or with actual hardware. The hostnames and IP address of the host computers have already been configured, therefore no additional configuration is need on these devices. Learn to configure VTP on Cisco Catalyst switches. Learn to configure DTP on Cisco Catalyst switches. Learn to manually force STP Root Bridge election. Configure the hostname on all routers and switched as shown in the network diagram. Configure no ip domain-lookup on all routers and switches. Configure the enable secret password as cisco on all routers and switches. Configure the console and vty password as sanfran on all routers and switches. All switches should run VTP version 2. All switches will be assigned to the domain CCNP. DSW1 and DSW2 switches should allow VLAN creation, deletion and modification. ASW1 and ASW2 switches will be configured as clients. All switches should use a VTP password of cisco. Verify VTP status on all switches. Configure ASW1 so that its interfaces will only trunk if the upstream switch is Trunking. Configure ASW2 so that its interfaces will only trunk if the upstream switch is Trunking. Configure DSW1 so that its interfaces will actively attempt to become trunk links. Configure DSW2 so that its interfaces will actively attempt to become trunk links. Verify the VLANs have propagated to all other switches. Assign Fa0/1 of ASW1 and ASW2 to be in VLAN 100. Assign Fa0/2 of ASW1 and ASW2 to be in VLAN 200. Verify the PC1 can ping PC3 but not PC2 or PC4. Verify that PC2 can ping PC4 but not PC1 or PC3. Configure switch DSW1 so that it is automatically elects it as the root bridge for both VLANs without explicitly specifying a priority value. Configure switch DSW2 so that it is automatically elected backup root bridge for both VLANs without explicitly specifying a priority value. Verify STP operation in case of DSW1 failure. Hi, Fernando. I totally miosspke when discussing modes. Our fix is to set the switches to transparent mode so they don’t participate in VTP with other switches. I mentioned client mode in my comment above. Sorry about that. :(VTP is worthless to us because of the number of switches on which our VLANs reside. At most, we have 5 or 6 switches for any VLAN, so it’s not worth the risk of catastrophic failure if VTP bites us. If we had, say, 15 switches, we might reconsider. I did the same for vlan 200. Lab showing incomplete ?